Salad isn't just a summer affair. When the weather turns a little cooler, salad needs a little more oomph and weight to it. This cheese ploughman's salad does just that. It is a lovely mix of fresh, delicious salad leaves and topped with grilled cheese, Ploughman's pickle and a dash of Worcestershire sauce. The adding of the grilled cheese, bread and pickle turns a simple straightforward salad into a great snack, supper or lunch dish and children love eating salad this way. And, by the way, it is also good for you too. You may recognise the grilled cheese in this recipe, it is essentially a Welsh Rarebit. This recipe serves 4 as a light lunch or snack, 2 if you want a really hearty meal. Toast each slice of bread under a medium grill or brown in a hot grill pan. Spread each slice of bread evenly with the Ploughman’s pickle. Coarsely grate the cheese, then divide between each slice of bread making sure each has a good, thick topping of cheese. Cook under a hot grill until the cheese has melted and slightly bubbling but not too brown, about 1 minute per slice. Once the cheese has melted, spread the cheese across the bread slice making sure the crusts are covered. Sprinkle liberally with the Worcestershire sauce. Place back under the grill and cook for another 2 minutes. Once cooked, remove from the grill and put to one side. Once cooled slightly, cut into chunky bite-sized pieces. Meanwhile, in a bowl, whisk together all the dressing ingredients. If needed, wash and pat dry the salad leaves. Place them into a large salad bowl. Add the pear slices and the dressing. Toss lightly being careful not to break the pear up too much. Divide the salad between 4 plates. 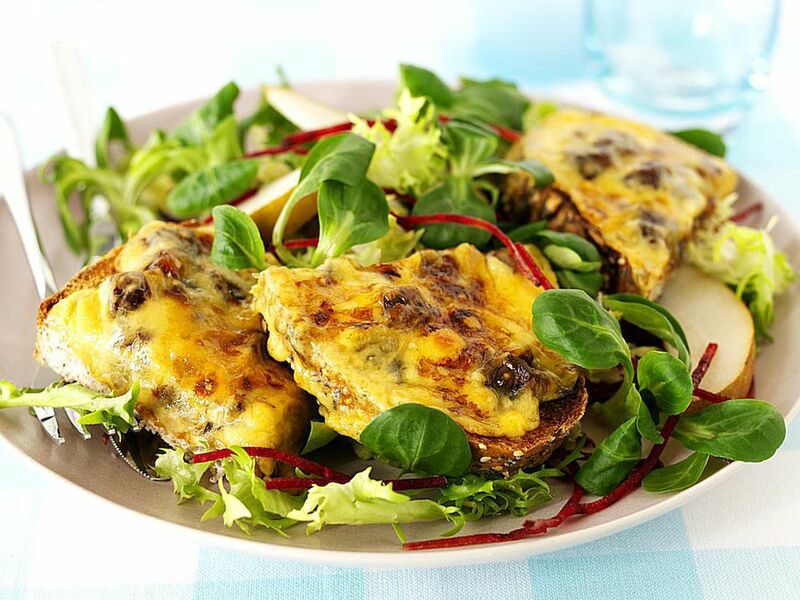 Top each salad with the toasted cheese pieces and serve immediately. Notes: If you like a more hefty salad, steam cook baby new potatoes, leave to cool slightly then add to the salad. Ploughman’s pickle is a type of pickle known as Branston Pickle in the UK. Branston is a thick dark chunky relish-type pickle made from finely chopped vegetables bathed in a thick dark sauce. The sauce is named after the village of Burton in Staffordshire, where manufacturers Crosse & Blackwell first produced Branston pickle in 1922. This recipe is based on a recipe from Make More of Salad, a campaign to encourage eating more salads for a healthier lifestyle.